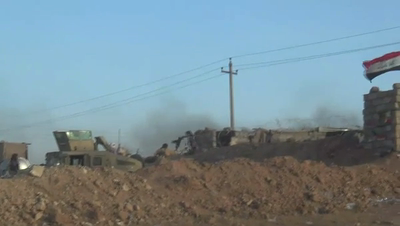 Video shot by a member of ISIS shows ISIS militants capturing an Iraqi Army outpost in Ramadi. Gunfire and shouting can be heard as ISIS fighters are seen advancing towards the military post where an Iraqi flag is flying. Ramadi, the capital of Anbar, Iraq's largest province, fell to ISIS when the group launched a large offensive at the beginning of May 2015. Disclaimer: The appearance of this video on Transterra Media website does not in anyway constitute an endorsement by Transterra Media of ISIS or any claims or statements made in this video. 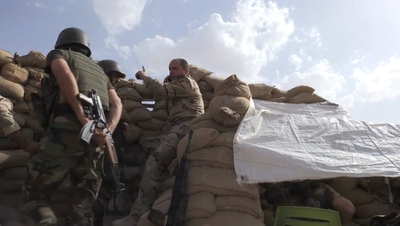 Kurdish peshmerga forces have been battling Islamic State militants outside the city of Sinjar since January. The peshmerga are holding the heights to the north of the city, while IS controls the city itself. There is no sign of any civilians left in the city. 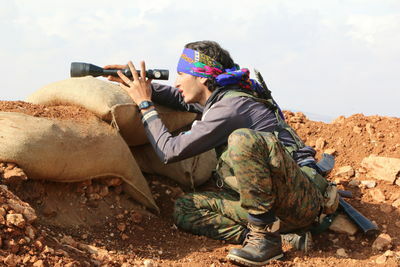 The warfare is largely static: both sides are stuck in their positions, sniping at each other, while IS occasionally tries to storm some of the Kurdish frontal positions, or lob mortars across their lines into the rear. Low on heavy weapons themselves, the peshmerga typically call in coalition airstrikes when they spot IS forces moving around. On 25 and 26 May, when this report was filmed, the Kurds called in nearly a dozen airstrikes. The city of Sinjar is important because sits on a road between Mosul, Iraq, and Raqqa, Syria, the two biggest cities controlled by IS. 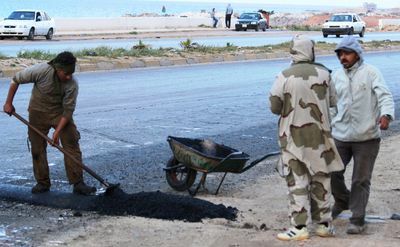 The militants use the road to move personnel and equipment between the two major theatres of war. The 12th peshmerga brigade, which has been on the lines since the beginning of May, lost 13 killed and nearly a hundred wounded in their first three weeks of deployment. Dozens of armed men from the Awamer clans paraded against the Houthis in Hawarem, a desert area in the southern Yemeni province of Hadramawt near the border with Saudi Arabia. 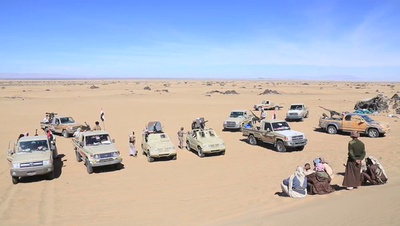 This video shows the tribesmen driving a convoy of pickup trucks and SUVs that carry the Awamer tribal flag in a desert area while brandishing rifles, machineguns and rocket-propelled grenade launchers. The men are then seen forming a circle and chanting, as well as shooting their weapons in the air. 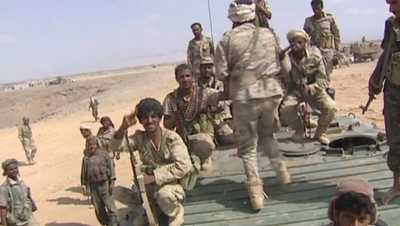 Fighters of the Belobeid tribe proudly tout their guns and artillery in the southern Yemeni desert of Shabwah, an Al-Qaeda haven. Just as the Saudi-led coalition began bombing Houthis and loyalists to ousted president Ali Abdullah Saleh, hundreds of fighters from the Belobeid tribe began joining forces in the desert of the southern province to begin organizing a coordinated resistance against the Houthis. In the past few months, the ongoing expansion of northern Yemen's Houthi rebels has prompted many tribes in the restive south to pull together. 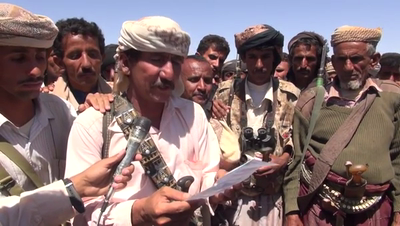 One man interviewed says they are fighting against both the Houthis and "terrorism" as such. “We are against Houthis and terrorism alike.” "We are against [UNINTELLIGIBLE] country"
“Peace be upon the Prophet Mohamad and his honourable descendants. Today is the day of reunion in this historic area. Return to history, roots and authenticity. We are gathered to unify the voice of all Belobeid clans. We confirm that that Belobeid are a solid bloc that shall not be broken. Throughout history, we have preserved the security of our area [UNINTELLIGIBLE] al-Soda. We have preserved our security and safety against any kind of aggression. What is happening in Sanaa is their own conflict, we are not concerned with it in any manner here in the south. We have proved our presence. The security of Belobaid is equivalent to the security of the whole land of the south, from Mahra to Bab al-Mandab [UNINTELLIGIBLE]." Close view of an explosion that rocked a munitions depot belonging to Houthi rebels in the southern port city of Aden, in Yemen, on Saturday, March 28th. 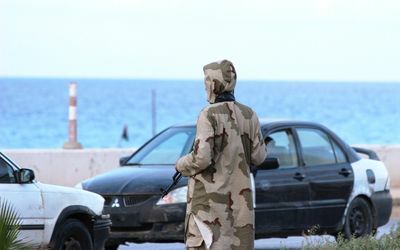 Unverified reports say that fighters loyal to former President Ali Abdallah Saleh have attacked the installation, located in al-Hadid Mountain in the outskirts of Aden. Reports say that at least 20 Houthi fighters have died in the explosion. 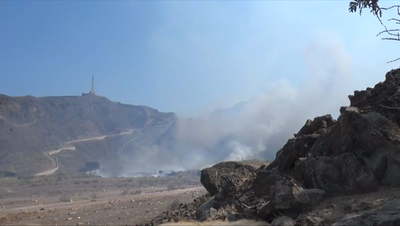 Video shows flames erupting from what is believed to be an ammunition storage facility in Mount al-Hadid, which oversees the southern Yemeni seaport city of Aden. 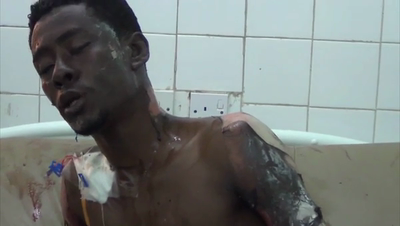 The footage also shows a number of people who were injured in the incident at a hospital. The depot, which had been held by forces loyal to ousted President Ali Abdullah Saleh, an ally of the Houthis, was being looted. 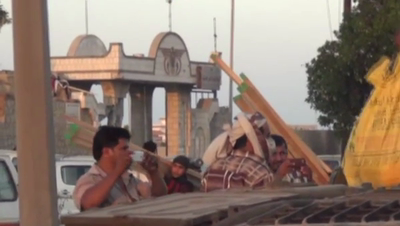 Video shows fighters loyal to Yemeni President Abed Rabbo Mansour Hadi on the outskirts of Aden airport. Popular Committee militias, which are tribal forces that support Hadi in the ongoing conflict with the Houthis, were able to retake the airport on Thursday, March 26, from the 39th Armored Brigade loyal to ousted President Ali Abdullah Saleh, a strong ally of the Houthis. Hadi's troops are seen confiscating weapons and ammunition from the special forces' military base which was under the control of Houthis and their allies. Houthi militants, allegedly backed by troops loyal to former President Ali Abdullah Saleh, captured a key military airbase in the province of Lahij. According to a New York Times report, this base was used by American in "counterterrorism" operations. The airbase was use The Houthis are now just 40km away from the city of Aden where President Abed Rabbo Mansour Hadi fled after being evacuated from the presidential palace in Sanaa. The video shows Houthi militants roving the streets of Lahij in military convoys and grounded fighter jets at the Al-Anad military base. 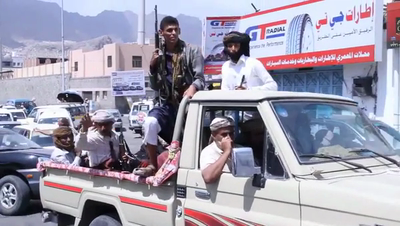 Militants loyal to President Abed Rabbu Mansour Hadi clash in Aden on March 25, 2015 with Houthi-allied units of the army, supported by heavily armed Houthi fighters. Parts of Aden are still under the control loyalist militias, however Houthi forces are making gains in some parts of the city. A large number of people on Wednesday, March 25 morning reportedly tried to storm into a Yemeni army base in order to obtain weapons and clashed with forces loyal to President Abed Rabbu Mansour Hadi. Hadi is said to have fled Aden as Houthi rebels advanced on the city after unidentified warplanes hit positions located near his residence. His whereabouts are unknown since fleeing the capital Sanaa to Aden, where Houthi fighters placed him under house arrest. 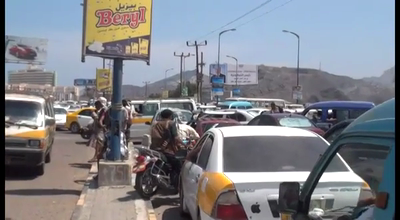 Video shows civilians running on the streets in Aden, south Yemen as heavy gunshots are heard. Houthi fighter and combatants loyal to ousted President Ali Abdullah Saleh, which are allied to the Houthis, also appear manoeuvring military vehicles. Hadi is said to have fled Aden as Houthi rebels advanced on the city after unidentified warplanes hit positions located near his residence. Hadi’s whereabouts are unknown. Hadi had fled the capital Sanaa to Aden, where Houthi fighters placed him under house arrest. 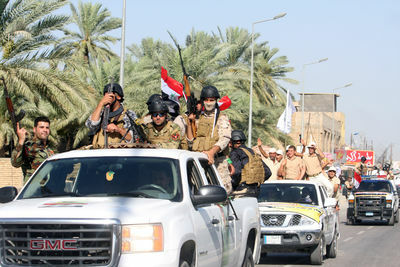 Fighters belonging to the militia of the Shiite Badr Organization clash with ISIS militants in the village of Ad-Dawr, Iraq south of Tikrit. 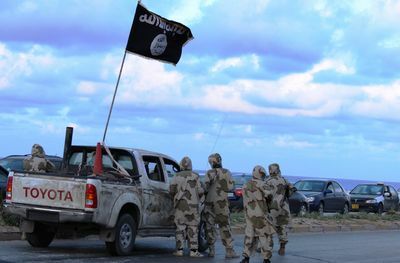 Militia leaders say ISIS was forced to retreat, giving Badr fighters control of the village. 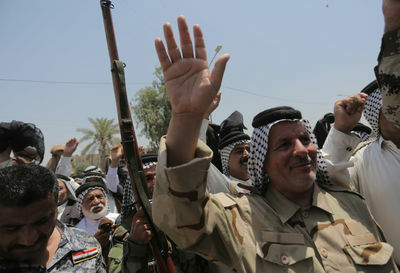 During the battle Mustafa al-Amiri, son of the Badr militia commander Hadi al-Amiri was injured. (00:24) Fighters chanting: "Labayk ya Hussein [We are answering the call of Hussein]." "Labayki ya Zahraa [We are answering the call of Zahraa]." (04:07) Fighter 1: "We are at the front line with the enemy, it is a tactical attack for the military forces who started to move forward, Victory is ours." (05:37) Fighter 2: "We will not withdraw, until the last minute, only death can take us back to our families before retrieving Najaf. There is noway we are going back, and we want to avenge our martyrs in Spiker." (07:05) Fighter 3: "We ask God to help us achieve our goal, for the sake of al-Hussein, the martyr in Kerbala. We ask God to help us achieve victory against our enemies, for the sake of al-Huseein, al-Zahraa, Abi Abdullah al-Hussein, and Ahl al-Bayt [the people of the House]." (08:32) Fighter 4: "Those are the people who killed the martyrs in Spiker. We will avenge them, until we reach Mosul." 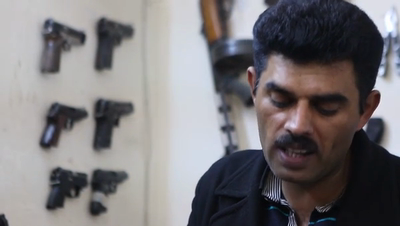 The Kurds’ war against the so-called Islamic State may be grabbing headlines for the battles on the frontline, but far from the fighting the conflict has been good business for 36-year-old Kurdish Erbil gunsmith Bakhtiar Sadr ad-Din Aziz. Aziz specializes in repairs and custom guns for the Kurds, and Peshmerga are lining up to pick up one of his custom creations, or just to get fixes done on one of their aging AK-47s, M16s or DShK heavy machine guns. Bakhtiar’s shop is located in the Iraqi Kurdish capital Erbil’s central bazar, and Bakhtiar said it is a family business that was owned by his father, who was once imprisoned by the Saddam Hussein regime for supporting the Peshmerga. The International Defence Exhibition and Conference (IDEX) held in Abu Dhabi, United Arab Emirates February 22 to 26, 2015. 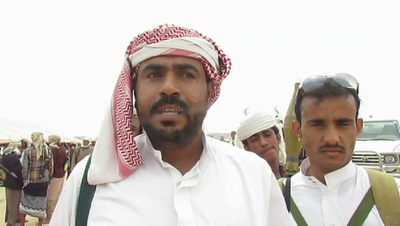 Sunni tribesmen, belonging to the Markha al-Alya tribe of the southern Yemeni province of Shabwa, announced today that they are closing their border with the neighboring al-Baydaa province. Situated to the west of Shabwa, al-Baydaa has been the scene of fierce battles between the Houthis and local tribesmen, who are trying to prevent the Houthis from advancing south. In their announcement the Markha al-Alya tribe emphatically rejected the constitutional declaration of the Houthis and banned any military group from entering Shabwa. They have positioned their fighters along the border and installed sentries on the Farsha passage, the road which connects the neighboring provinces. The tribesmen assured that they will defend their land to the death and not allow it to become a thoroughfare for Houthis and other armed groups to transport their soldiers and weapons. They are working in conjunction with the local authorities who support their mission to defend Shabwa. "Based on the agreement among the tribe leaders, dignitaries and local authorities, we announce that we refuse the constitutional declaration made by the Houthis. We support the constitutionally legitimate authorities and will not accept any agreement outside the consensus among political powers in Yemen. Our stance regarding the Shabwa province follows that of the governor. It is guided by the governor of Shabwa as well as the security committee and the tribes in Shabwa and the regions of Hadramoot and Muhar al-Shabwa. We will stand against anyone who wants to use our province as a gate for chaos, whether they are armed militias, tribes or [any other] groups. We declare our support of the local authorities in the province in their bid to protect Shabwa borders from all directions." Tribesmen in the predominantly Sunni area of Ma’rib, east of Sanaa, prepare for war with the Houthis and threaten to create their own autonomous state within Yemen. 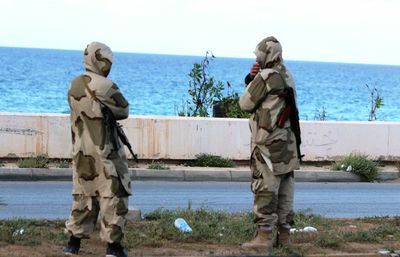 The tribal fighters have installed checkpoints, known as “matarih”, in the middle and around the perimeter of Ma’rib. In local tradition this act is considered as the highest possible security precaution, putting local tribal disagreements to one side. 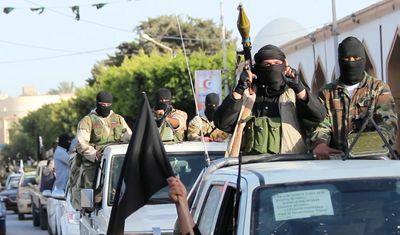 The “matarih” is enforced by fighters patrolling the area in heavily armed convoys and setting up fixed bases in tents. This precaution may last days, months or even years. The tribal elders believe that the drums of war have been beating ever since Houthi militants took over the capital Sanaa and forced the president to resign. Abdullah bin Jaradan, a prominent tribal leader, says that they will not recognize the Houthis as legitimate rulers of Yemen and they will not put down their guns unless president Hadi is restored to office. In order to prevent a Houthi takeover in the oil-rich province of Ma’rib, the elders have assembled a fighting force to defend their lands and resources. 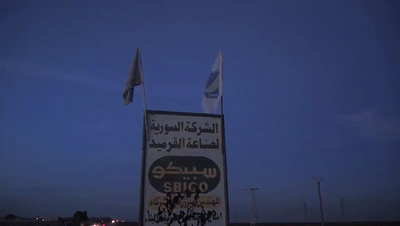 Ma’rib is considered an area of great strategic importance due to its oil fields. It produces around 25,000 barrels per day. Fourteen-year-old Mohammad Khodr al-Hajji left school more than a year ago to fight against the forces of President Bashar al-Assad. Mohammad joined the opposition battalion formed by his father. He receives regular military training and has been positioned on the frontline outside the town of Morek near Hama, in an area called al-Sayyad. Opposition fighters took this area from the Syrian government’s forces fourth months ago. In a year or two, Mohammad hopes to actively engage in battles. Mohammad’s case is not unique. Many children have been drawn into the Syrian conflict as it nears its fourth year. 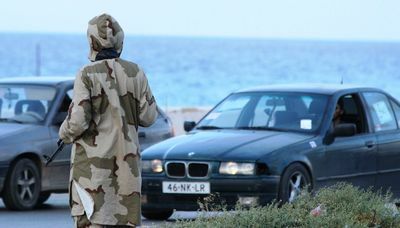 According to a Human Rights Watch report, non-state militias of different affiliations have recruited dozens of teenagers and given them perilous military tasks. Khodr, Mohammad's father, says that even though his son is young, he might not be safer at home because he could die in an airstrike. “I am Mohammad, the son of Khodr. I was at school and I was watching TV. I saw destruction and children. I went for the quest of freedom, against Assad’s infidel regime.” Wide of Mohammad walking with other fighters. 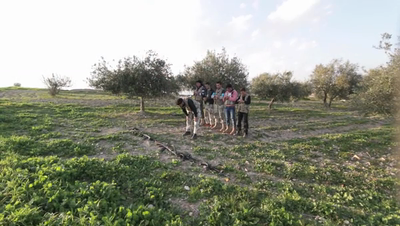 Wide of Mohammad with other fighters in a trench shooting. “I have been here for a short while, but my father taught me how to use weapons and to shoot, thanks be to God. I was with my friends and I saw that they all participated in Jihad, and I wanted to be like them. I have not been in school for many years. I was in the eighth grade. I stopped going to school. There was an air raid. A warplane hit the school and we stopped going there. When I first grabbed the rifle I felt something very great. There is no work. People have stopped working. We want to work but there is nothing to do. I kept participating in the revolution. I will keep resisting until I die. 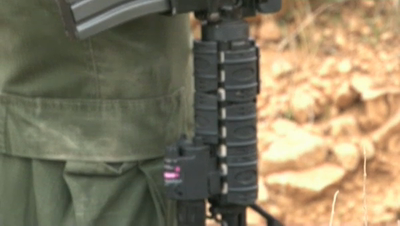 Close-up of Mohammad cleaning rifle. Wide of Mohammad in trench with other fighters. "He [Mohammad] saw that his brother and I were involved [in the revolution]. He began to insist to accompany me, so I took him with me. His brother and I trained him to use a rifle. I showed him how to disassemble and reassemble the rifle. Then he wanted to shoot, so I showed how. Various of Mohammad and other fighters praying behind Khodr al-Hajji. In the northeastern province of Hasaka, Syria, the Christian Assyrian community has formed its own police force. Members of Sutoro, which means “security” in the Assyrian language, said in interviews featured in this video that they protect their people. A Sutoro commander also invited all the Assyrians who left the area for their security to return. The first Sutoro headquarters was officially set up in the town of Derik (also known as Al-Malikiya) in 2013, in cooperation with the Kurdish PYD party, which has set up an autonomous administration in large parts of Hasaka province and other predominantly Kurdish areas. (00:18-00:32) "We came to defend our land, our people and our dignity. We are patrolling the streets and setting up checkpoints. All of this is to protect our people." "We are a security organisation that belongs to our Christian people. We are called Sutoro [security in the Assyrian language]. We established this security headquarters to solve our people’s problem in this area and to defend our churches and our people’s properties. In case we get any complaint, we register it and try to solve it and in case we were not able to solve it, we take it to the People’s Court. We have come to protect to protect this country. We want to say a word to our citizens, especially Christians who left this area and went to other countries because of the situation. We tell them to come back; do not be afraid of anything. There is nothing to be afraid of." 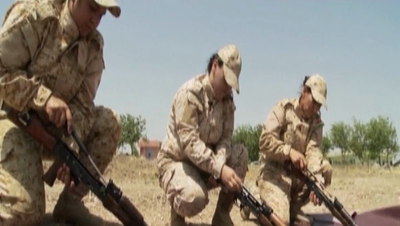 Special units of Kurdish women fighters train with the Peshmerga to fight against ISIS. 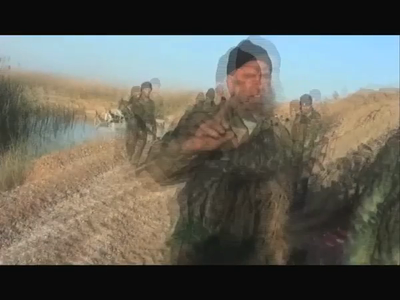 Video shows the women practicing with various weapons and methods of warfare. Christians living in the villages of Qaa and Ras Baalbek, near the Syrian border in Lebanon's Bekaa Valley, have begun arming themselves against extremist groups from Syria. 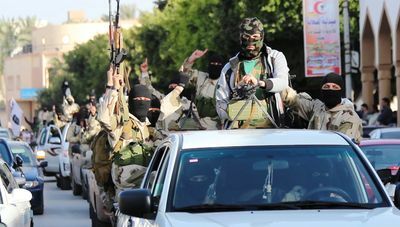 Volunteers are organizing village militias to protect their communities from Nusra Front and Islamic State militants whose plan is to extend their caliphate to the Mediterranean coast. 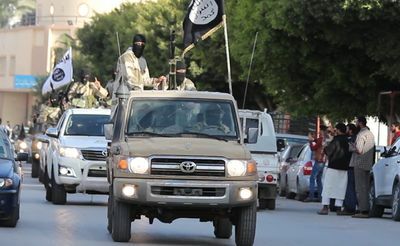 Abu George and Michel, two militiamen from Qaa say that they received threats from Nusra Front after the Islamist group attacked and destroyed the Christian town of Maaloula, in Syria, in September 2013. 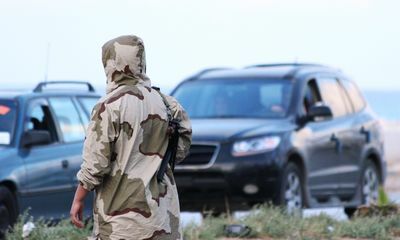 Threats have multiplied after clashes erupted in the town of Arsal in August between the Lebanese Army and Islamist fighters who crossed the border from Syria. 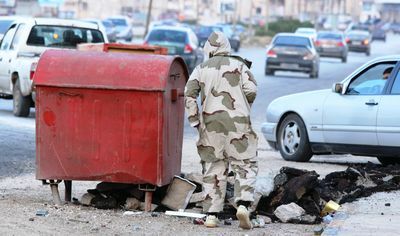 More than 20 Lebanese soldiers and policemen were captured in this incident, some of whom were executed. 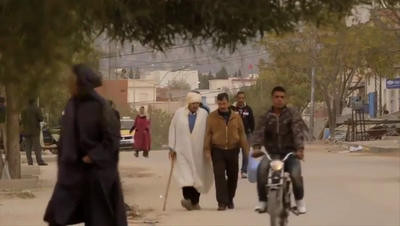 The municipality of Ras Baalbek has four men working as guards in the local police station. We stand guard at night and day, and when we encounter anything, we directly report it to the army, which takes action. There are six platoons from the [Lebanese Army] Airborne Regiment; there are soldiers from the Border Guard Regiment; and soldiers from the 8th Infantry Brigade are positioned on the border up there. Soldiers from the 8th Infantry Brigade position sometimes go on patrols. These mountains are empty; there is nothing there. There is fear that an infiltration might occur. It is very cloudy and we cannot see anything, and someone might cross over from there. Soon, when winter comes, the weather becomes very snowy and cold. Some of them [fighters] will have to escape the cold and eventually come to our village; this is why we have to have stand guard during the night with help of the Lebanese Army. If any [fighter] comes from the hilltops, the Lebanese Army will warn us. 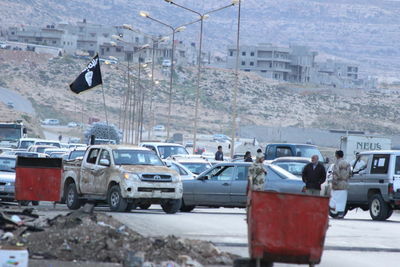 It will not be easy [for fighters to infiltrate] since they need at least two hours to get to the town. We would then have to move our children, women and elderly, and to defend our homes, honor and homes. As Christians, we are not afraid. We will never leave our land and homes, we are very proud as Christians. Jesus Christ is always with us. Every night, we have around 400 young men who assist the army and are always ready. There have been several infiltration attempts, which have been dealt with. Not long ago -- about 15 days ago -- an infiltration attempt took place and it was dealt with. These attempts are taking place in small numbers. They [fighters] have probably come to see whether there is someone who is vigilant or not, and they saw what they should see. Of course, they will not spare us. These people, despite the fact that they speak in the name of religion, are faithless and do not have no mercy on anyone; they do not have mercy on whoever they reach. We saw what happened to others and we do not want have to live the same experience. After what happened in Maaloula [a Syrian Christian town taken by Nusra Front], they threatened to do the same to us. They said they will do the same in one of the Christian towns of Northern Beqaa – our village is located in this area. This is a direct threat to neighboring villages and to us. October 30-31, 2014 Kobane, Syria A number of Free Syrian Army units have arrived in Kobane to assist Kurdish YPG forces in their struggle against IS. The two groups have joined forces directly on the frontlines and now fight side-by-side. 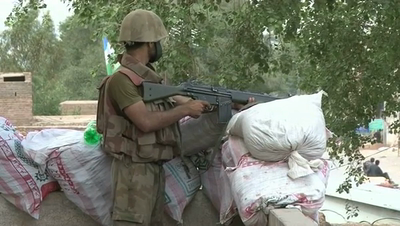 A moment of intimacy in the frontline of the mountain Bashiqa. 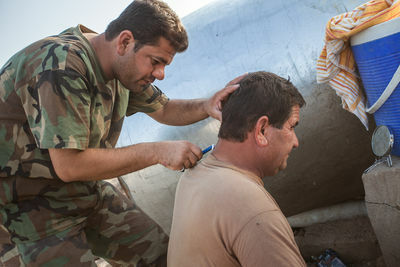 Two soldiers help to shave each other before taking their positions. 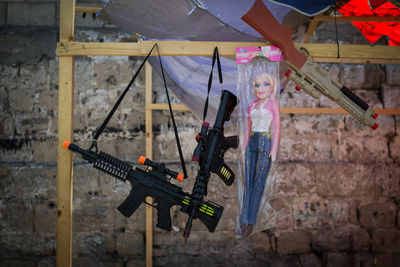 Toy weapons being sold on a public market in Gaza City on July 17th, 2014. The brigade of 2,500 fighters is independent and does not answer to any governmental authority. It is responsible for the protection of al-Ataba al-Abasey shrine and receives its orders from Iraqi-Shia spiritual leader Sheikh Ali al-Sayed al-Sistani. Iraqi-farmers from the area around Baghdad gather in the city to form fighting brigades that will fight ISIL. Under the administration of the Iraqi Ministry of Agriculture, the farmers are answering the call of Ayatollah Sayed Ali al-Sistani, the spiritual leader of the Iraqi-Shia, to take up arms against ISIL. The Ministry of Agriculture is helping organize farmers across the country form their own fighting brigades. 362 international arms manufacturers and military personnel took part in the 10th Annual Special Operations Forces Exhibition (SOFEX) at the King Abdullah I Airbase near Amman in Jordan where they demonstrated their latest high-tech military industry equipment. High ranking military officers were present to buy and sell the latest weaponry. 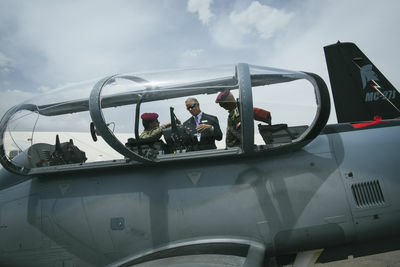 Aside from businessmen who attended the fair - one of the biggest in the world - to make good deals, many curious visitors came, mainly locals, excited to hold and point snipers and rifles, or to take a photo inside the cockpit of an helicopter. The exhibition began with a demonstration by the Jordanian Special Forces and the visit of the King of Jordan Abdullah II. 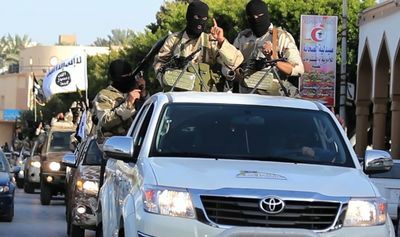 Armed militants affiliated to ISIS parade down the streets of Derna, Libya showing off their weapons and brandishing the black ISIS flag.